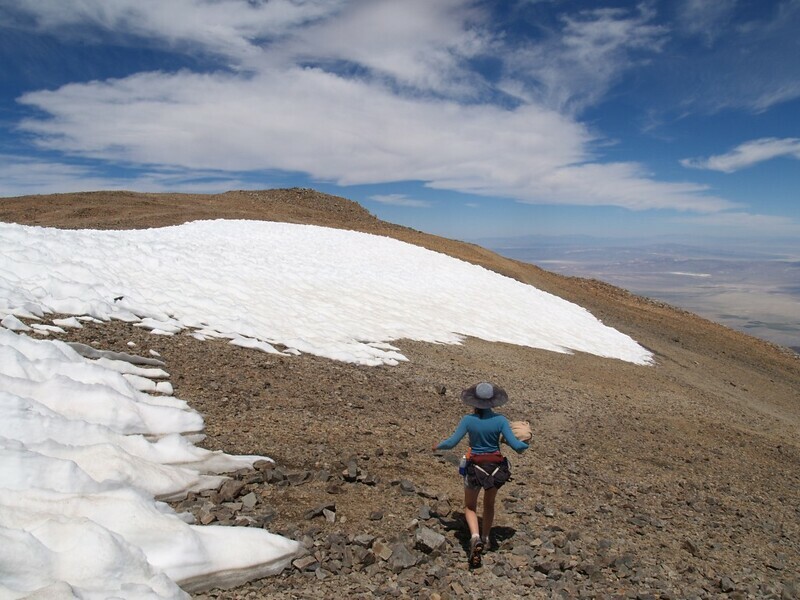 Having acclimated to the low oxygen at 12,000 feet in the Sierra, we didn’t want to spend much time at lower elevations before climbing White Mountain Peak, because we’d lose some of our hard-earned acclimitization. 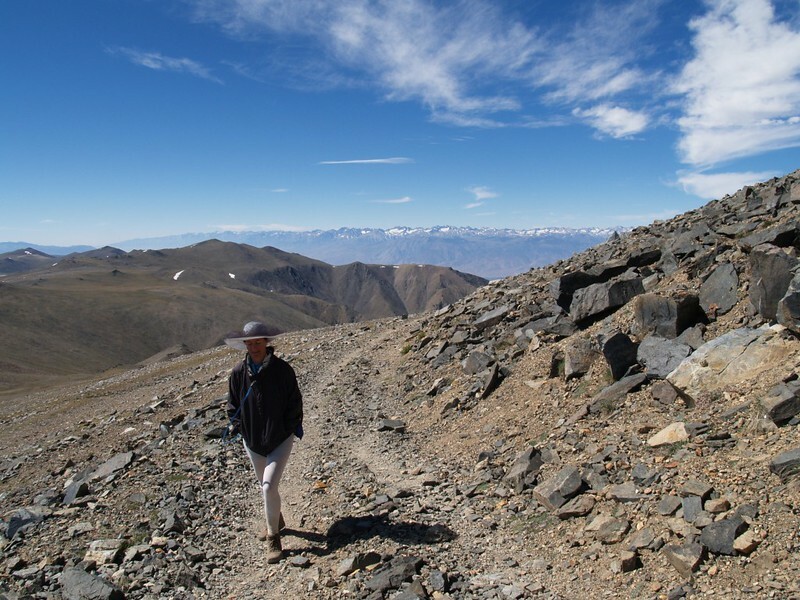 However, there was a deep valley between the two mountain ranges, so we’d have to descend, for a little while, at least. And it was a valley with a large town full of food and other wonderful things to distract us. We told ourselves that we’d have to keep our focus on the big goal, and not let comfy hotel rooms with showers beguile us. So we hiked down to the car which was parked at 10,000 feet, then drove downhill to Bishop, where we got stuck anyway. So much for focus. But at least it was only for a couple of hours. What did we do that was so important? Laundry. Because we stank after a week of backpacking. But did we take a shower? No. Don’t ask why. The important thing is that we got our focus back. 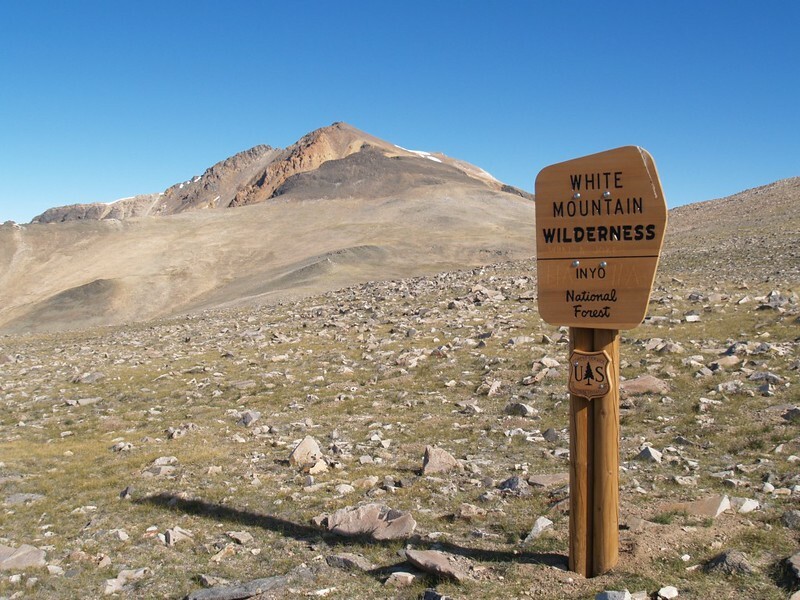 We put our clean laundry into the car and drove on up into the White Mountain Range, where the ancient Bristlecone Pines live. And that road climbed rather quickly, so soon we were breathing rarified air once more. On the way, we stopped to see one of the pine groves, but we didn’t stay long. 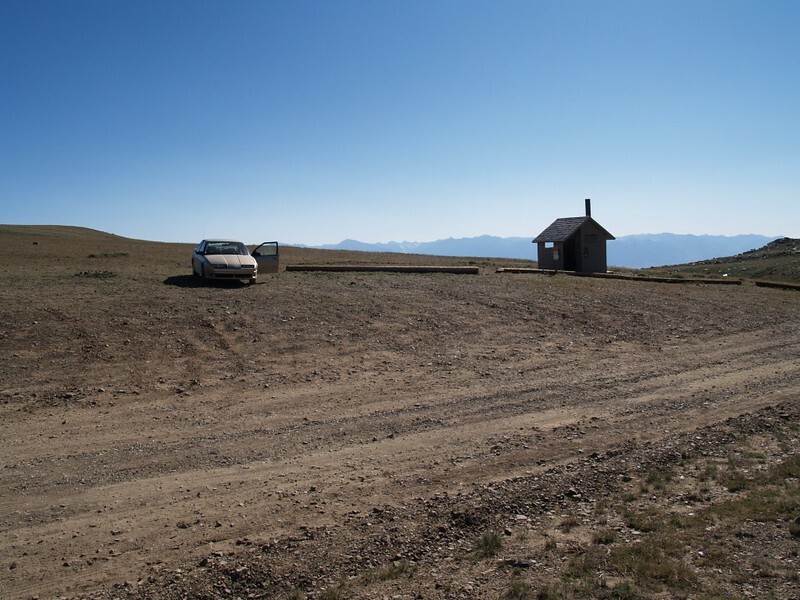 We headed for the end of that twenty mile long dirt road and saw an amazing sight: An outhouse at 12,000 feet. With a view! 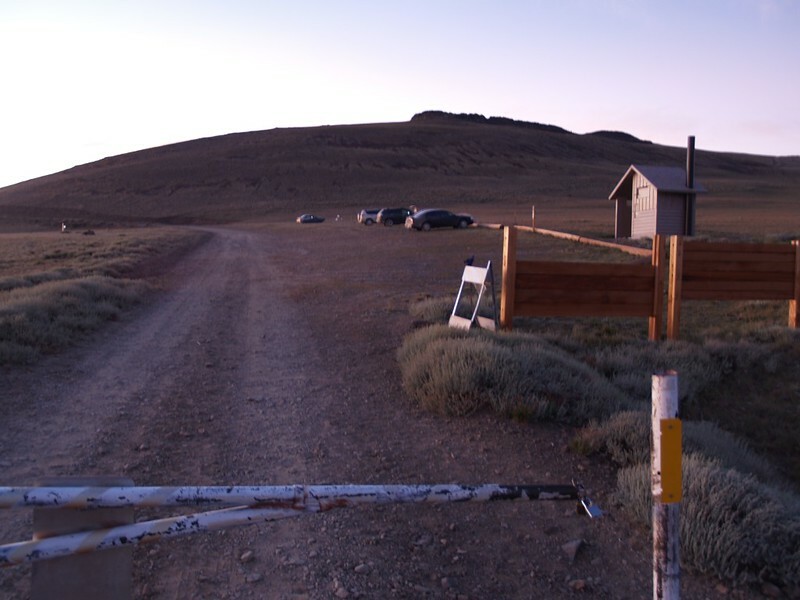 Driving on White Mountain Road, our first view of the Barcroft Gate Campsite was the outhouse! It was high and lonely up there, far above the treeline. There were a few other cars in the lot, hikers who were still out on the trail, so we wandered around, looking for a decent spot for a tent. There were lots of sharp rocks, and little soft dirt, due to the limited vegetation. We found a place where we kicked away the rocks, and set up camp. Then we ate dinner and simply relaxed. The hikers returned and we asked them about the trail. It was easy, but long, a fourteen mile round trip. 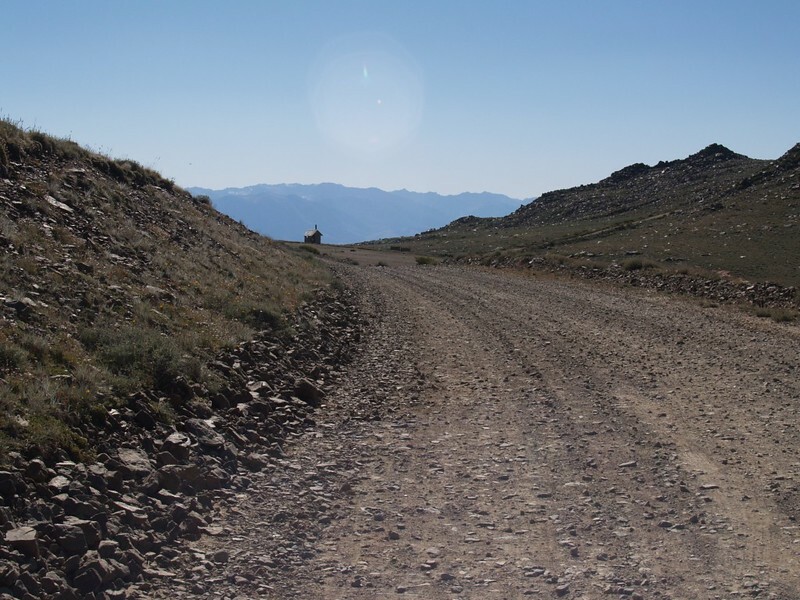 One of them discovered a flat tire on his truck, and I remembered reading that this dirt road was also known as the “Flat Tire Highway” due to all the sharp stones. 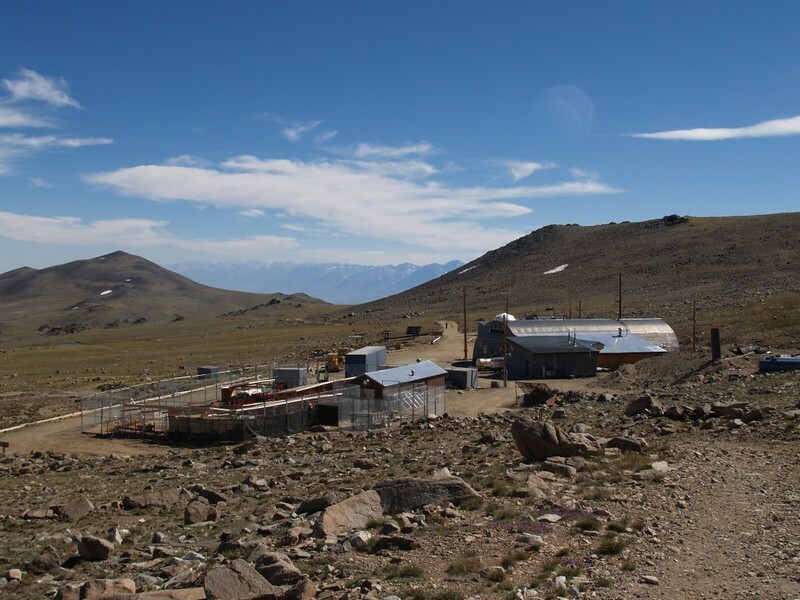 I also remembered reading about the marmots up here, and how they liked to nibble on rubber radiator hoses and car wiring, and so we got out the large tarp that we’d brought along for just this reason. None of the cars in the lot this day had had a problem, but we saw several big fat marmots in the area, so we didn’t want to take any chances. We laid out the tarp, drove onto it, then pulled the sides up around the car and held them with some rope. The car looked like it had a diaper on, but it was protected! 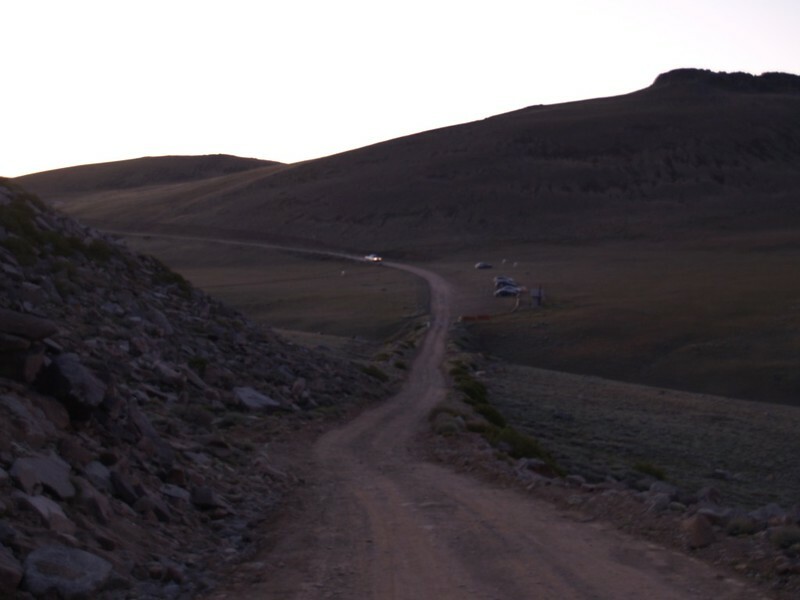 Meanwhile, our plan was to wake up well before dawn, pack up camp, and begin hiking at first light. So we went to sleep extra early, before sunset. Not only would we rest, we’d also be continuing our acclimating as we slept. 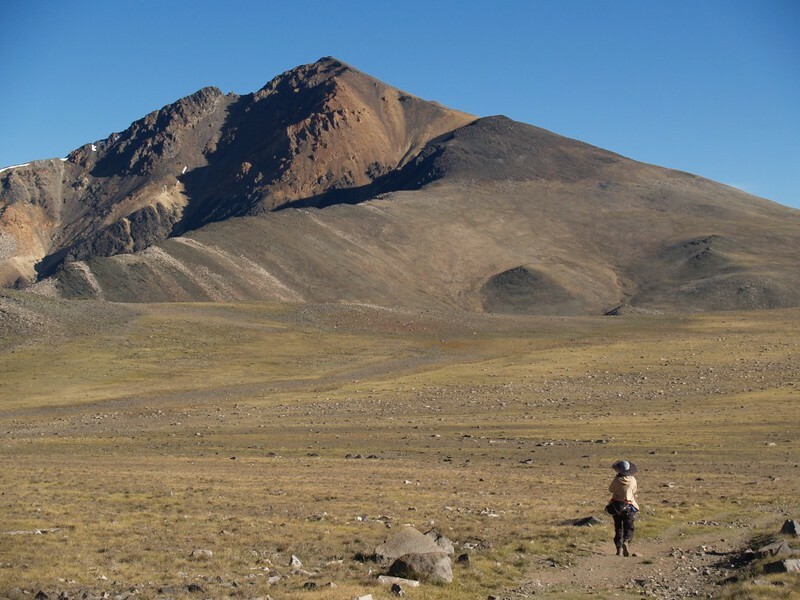 We’d need every last bit of it to make it to 14,246 feet. 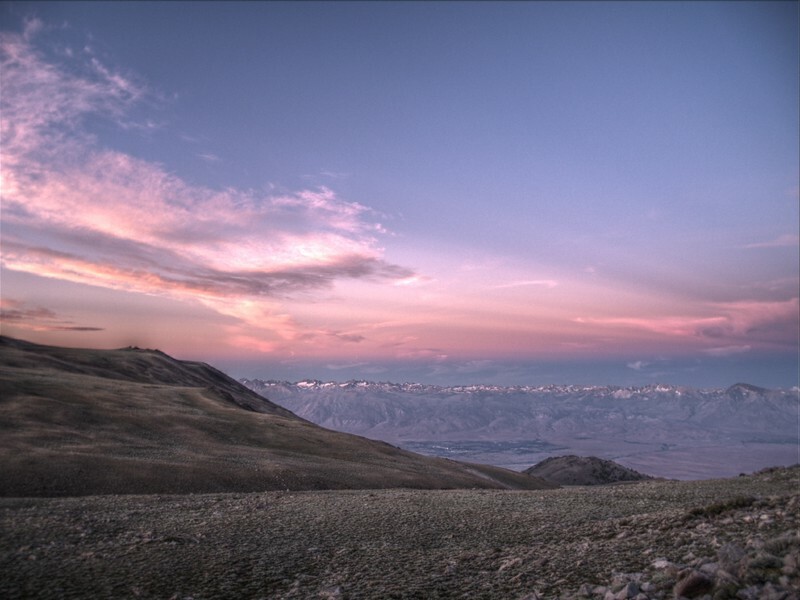 Outhouse with a spectacular view of the Eastern Sierra, at the Barcroft Gate Campsite. Campsite at the Barcroft Gate. Panorama video. We woke up super early, using my phone’s alarm. We used headlamps and got ourselves ready. It was cold out there, so we dressed in layers. Vicki made breakfast while I packed up the tent. I untied the anti-marmot defenses just enough to slip the tent and sleeping gear into the trunk. 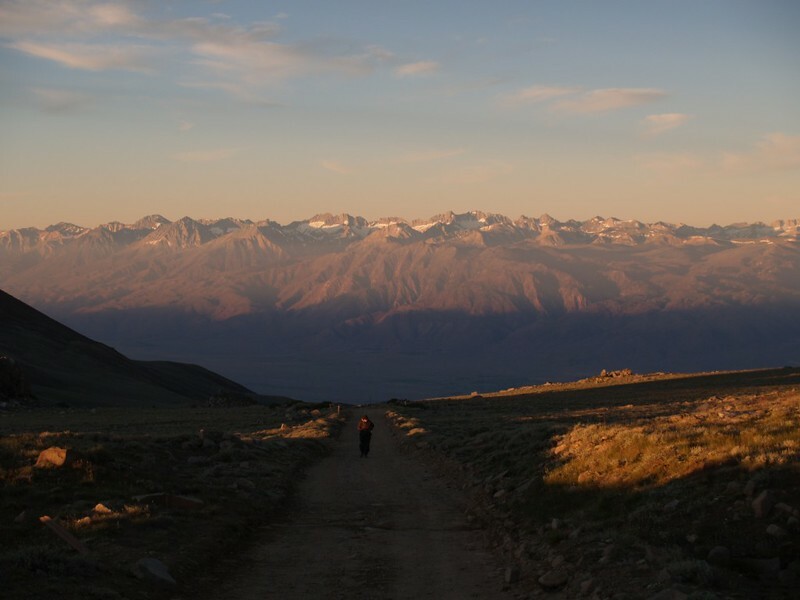 We began hiking while there was only the faintest alpenglow showing on the High Sierra many miles to the west. It was a great morning for photography, and I wasn’t hiking as fast as I could. But I didn’t care. 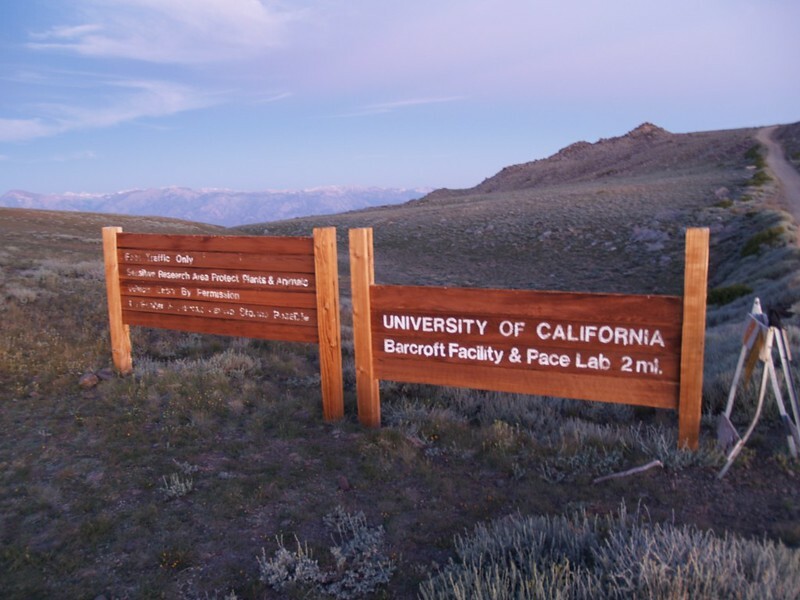 We were parked at the locked gate, but the road continued (all the way to the summit, in fact) for another two miles to the Barcroft Facility, where the University of California had a laboratory. Three other cars were in the lot, and the folks were all still sleeping inside them. We were the only ones to set up a tent. Another car arrived just after we started hiking, and he ended up passing us an hour or so later, so we had him take a photo of the two of us on the trail. We returned the favor later that day, on the summit. Barcroft Gate sign for the Barcroft Facility two miles up the road. 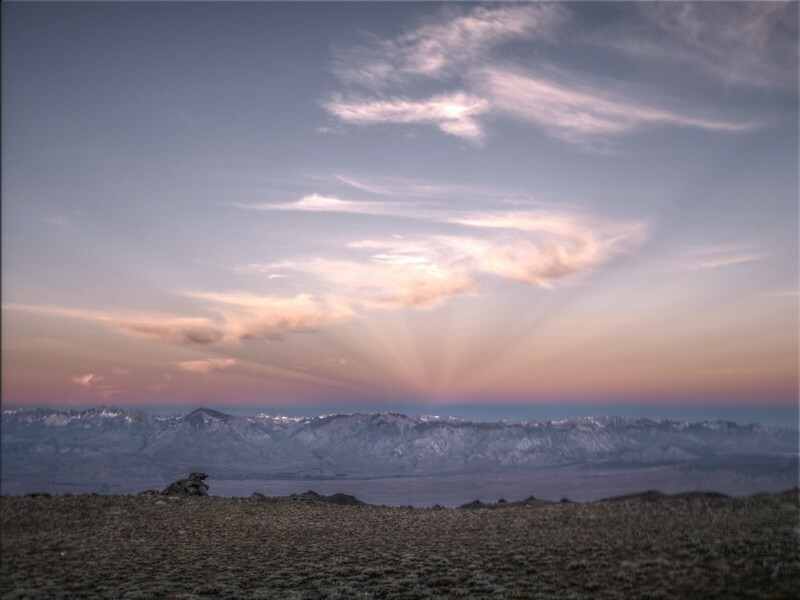 Sunrise over the eastern Sierra Nevada. 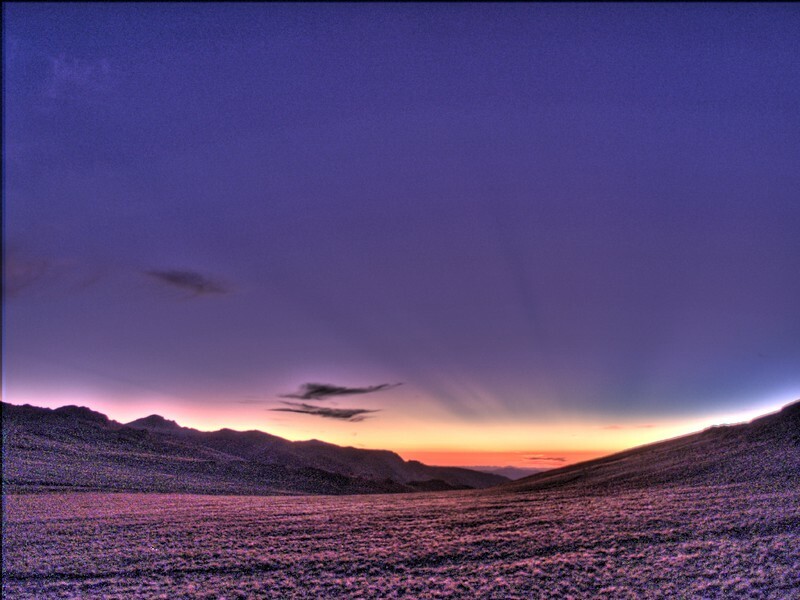 HDR of the sunrise and anti-crepuscular rays over the eastern Sierra Nevada. The Range of Light with Rays of Light! It was cold, that pre-dawn hiking, and there was an insistent breeze blowing out of the west. We were thankful for our windbreakers, but we still hiked as fast as possible, just to keep warm. We were also thankful for the sunrise, and hoped to warm ourselves as soon as the sun got high enough. 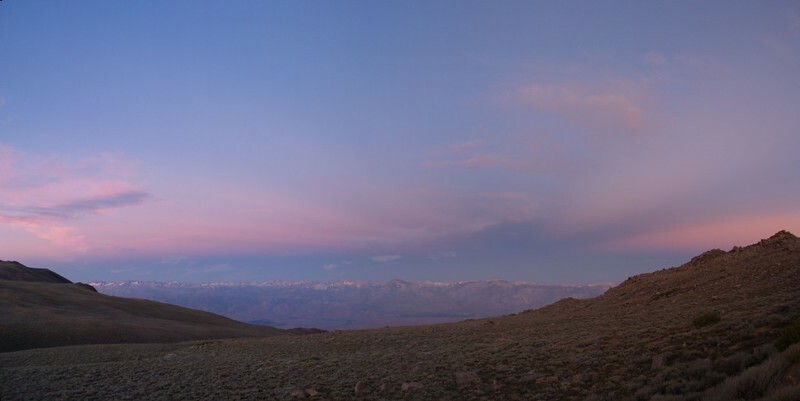 But the best part of the sunrise was seeing the morning light and shadows playing upon the Sierra across the way. Beautiful! It wasn’t long before we were able to see the Barcroft Facility up ahead of us. 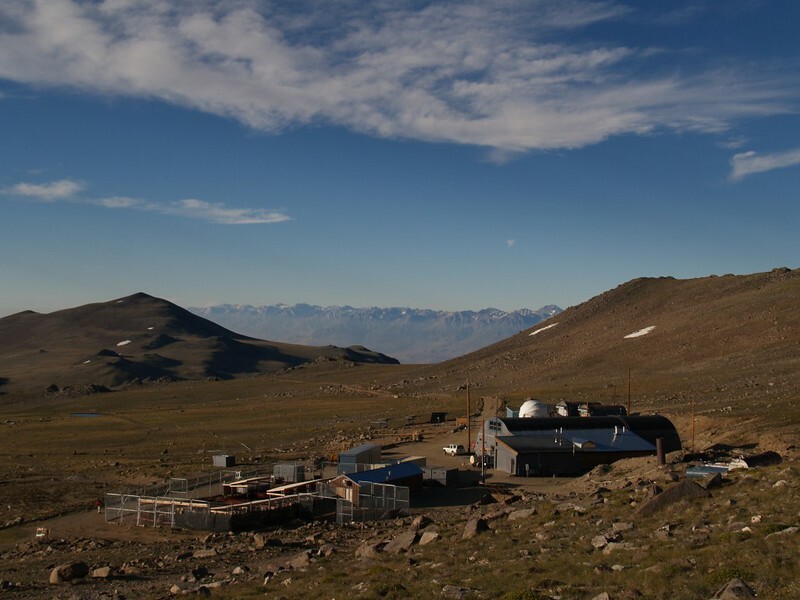 This is one seriously lonely scientific research outpost. It gets snowed-in early in the fall and stays that way until late spring, and I can only imagine how the cold thin air must howl in the winter. 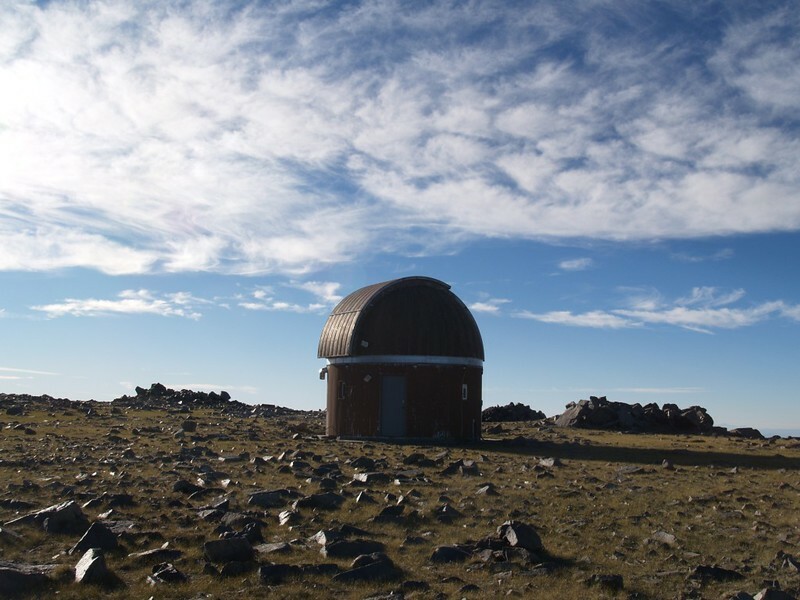 But the summer sure seemed to be a great time to be stationed in a place like this, with views like these. 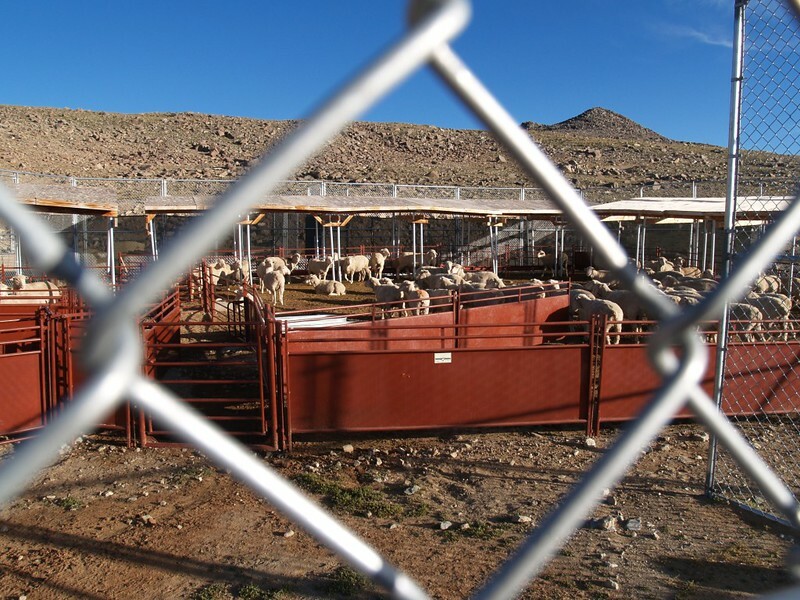 This was the sheep experiment area, luckily for the researchers the sheep are located on the east end of the facility, as that is generally downwind! After that we began heading uphill toward the Barcroft Observatory, which was high on the side of Mount Barcroft. The road became much less traveled here. 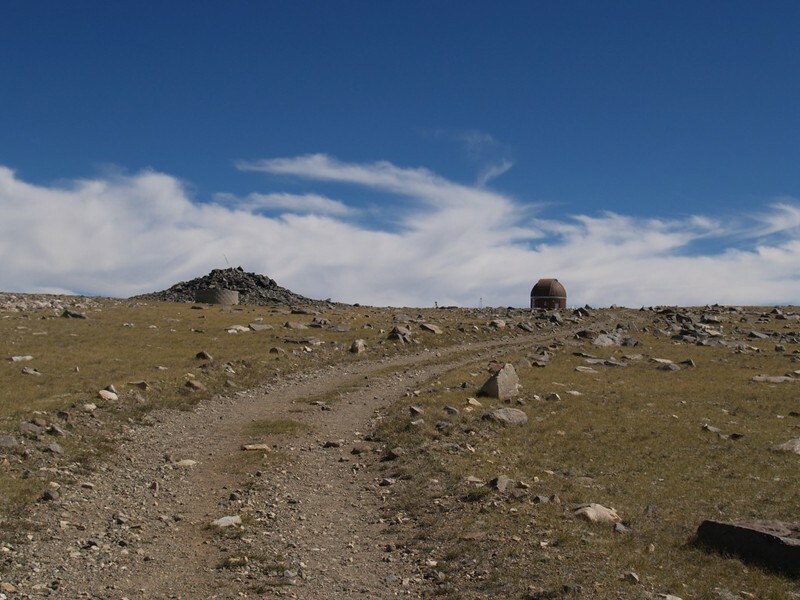 It was more of a rough jeep track, rarely used by any vehicle. This was predominantly reserved for hikers, although Mountain Bikes were allowed. After we passed the observatory, the main focus was White Mountain Peak itself, which rose off in the distance, several miles away. 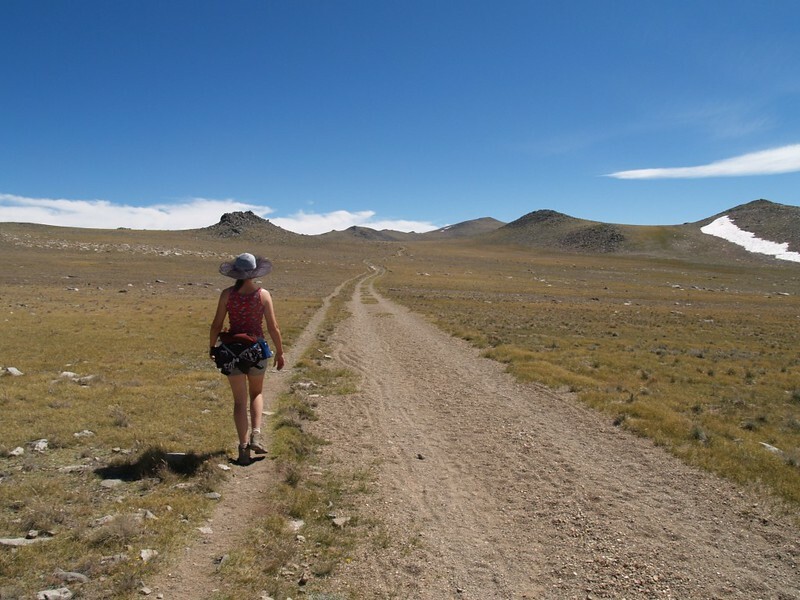 It looked to be a long, flat hike over the tundra-like vegetation before the main ascent would happen. 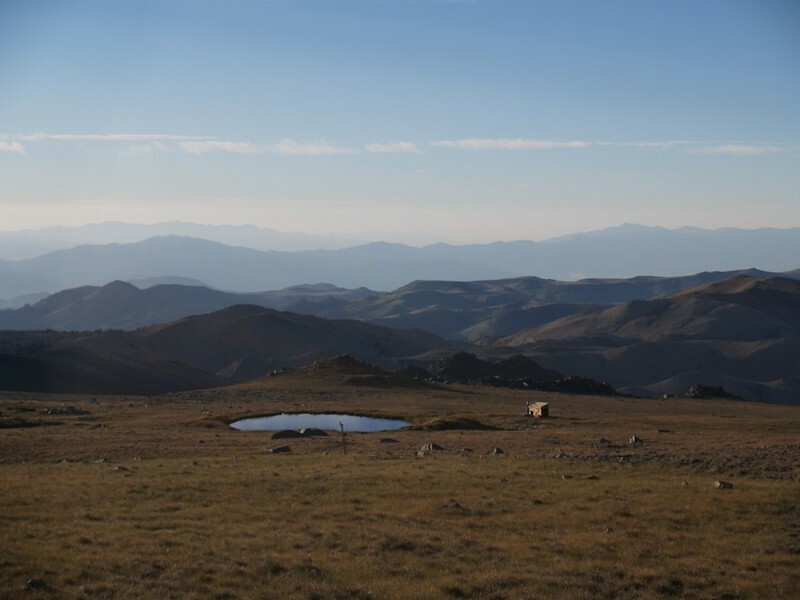 We were far above the treeline up here, in a land where the summers are short and the winters long and brutal. 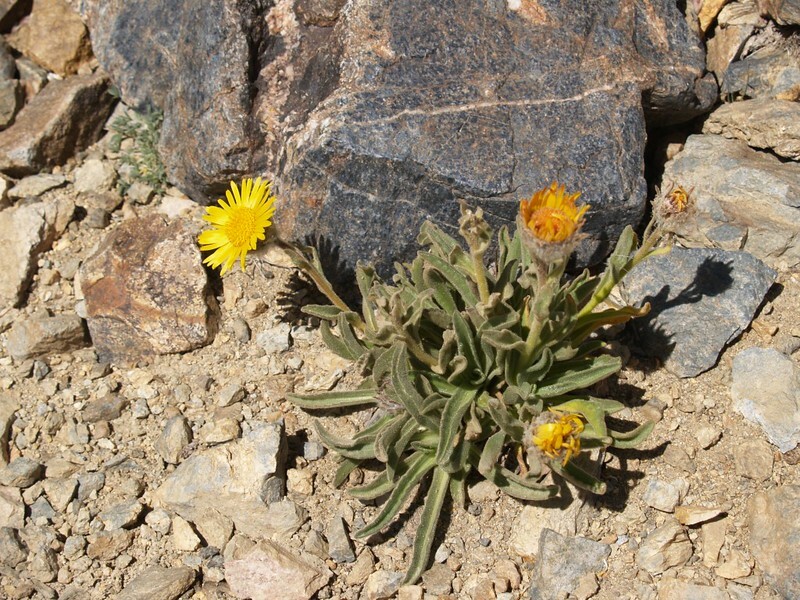 Not many plants can survive in these conditions, and the ones that did tended to flower and seed as soon as possible after the snow finished melting. 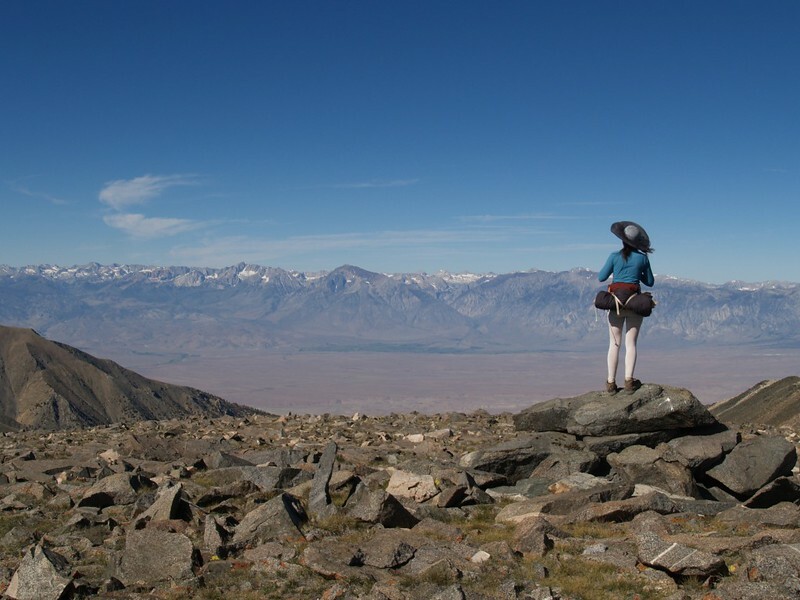 Vicki and the Eastern Sierra Nevada. I believe that is Mount Tom just left of center. 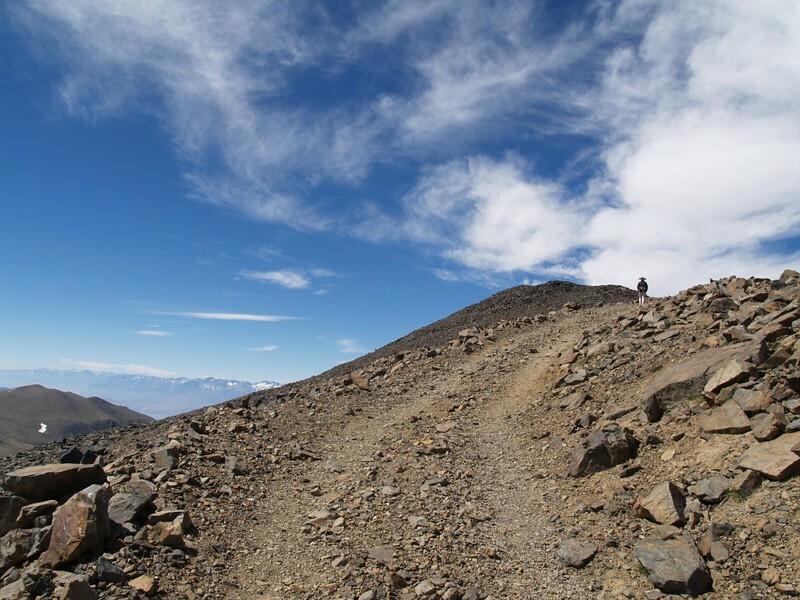 We eventually reached a prominance, a high point along the trail, and it allowed us to see the road ahead of us as it climbed, switchbacking up the mountainside. We were a bit sad that we had to lose some elevation for no reason, but I have to admit that it felt great to take some long, easy strides for a while. 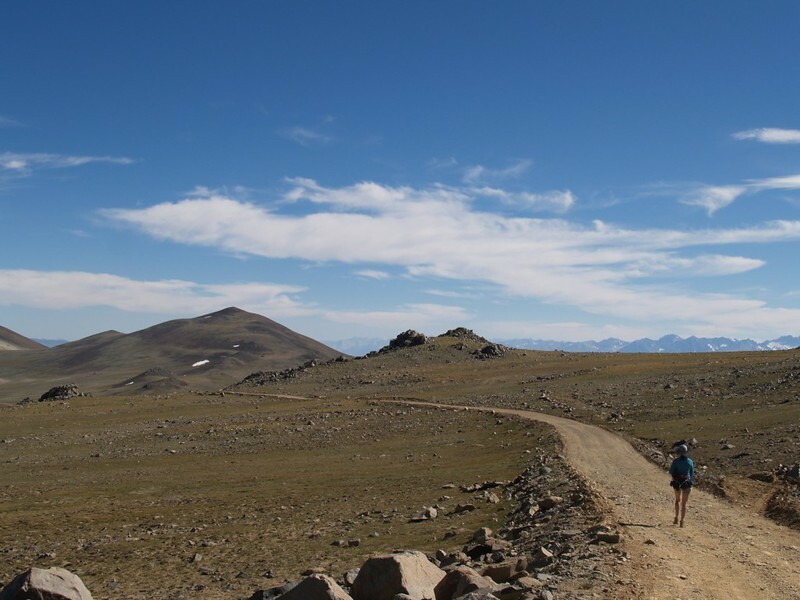 Still, the downhill didn’t last long, and then we were set for the main event of the day: Becoming Fourteeners! 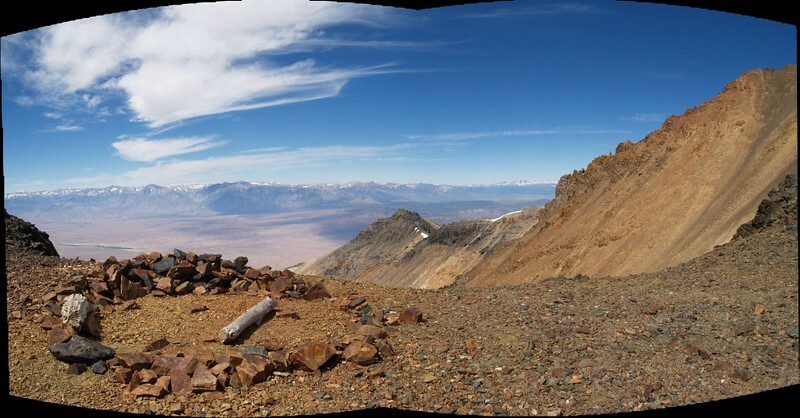 Another panorama shot toward the eastern Sierra from the slopes of White Mountain Peak. 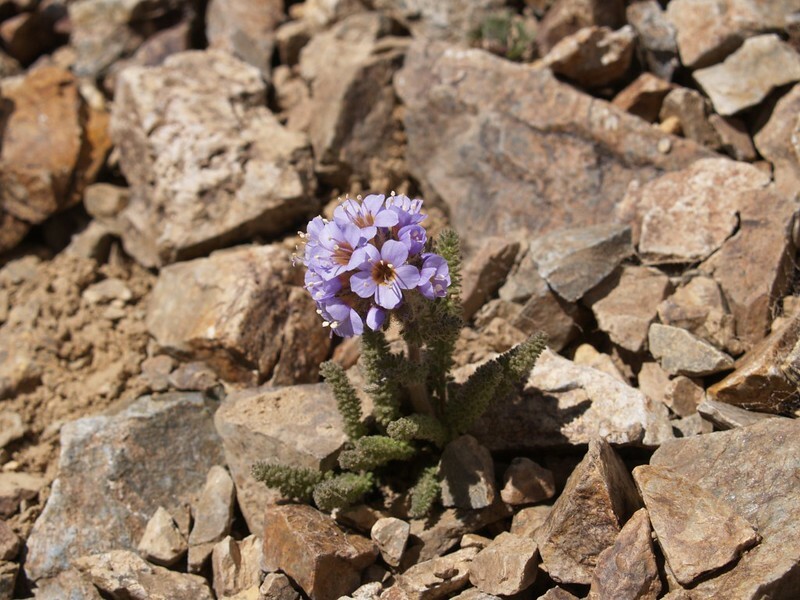 High altitude Alpine Gold flower (Hulsea). There aren’t many plants that can survive up here. 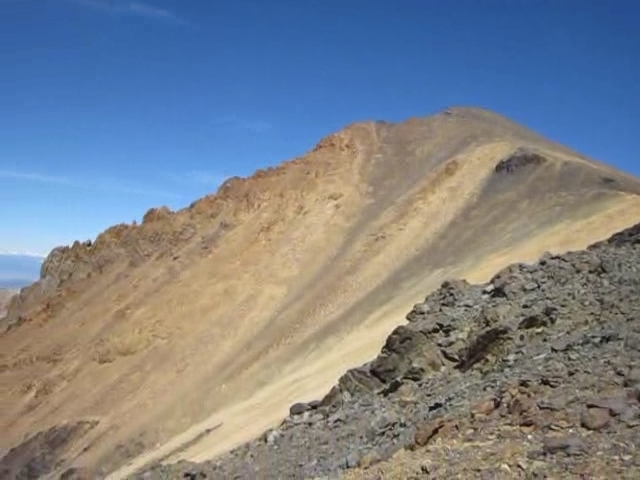 Panorama video from the slopes of White Mountain Peak. 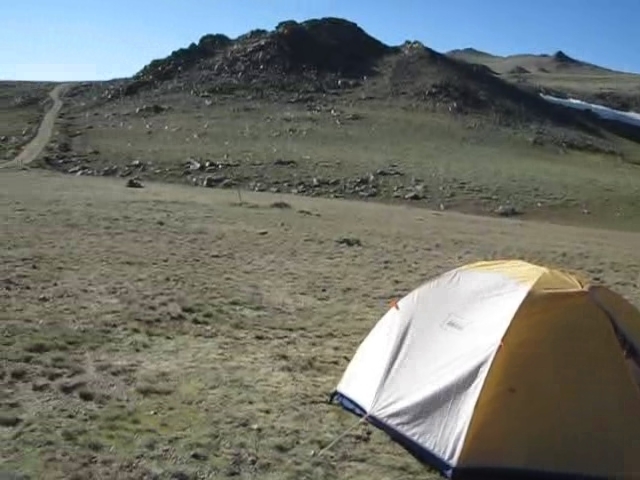 We discovered a campsite high on the slope of White Mountain Peak, just off the road at a saddle. I’m not sure how that wooden log got there, as the nearest Bristlecone pines are many miles away, and over a thousand feet lower! It was incredibly windy at this saddle, and that rock shelter wouldn’t be much protection, though much better than nothing. But what a view! 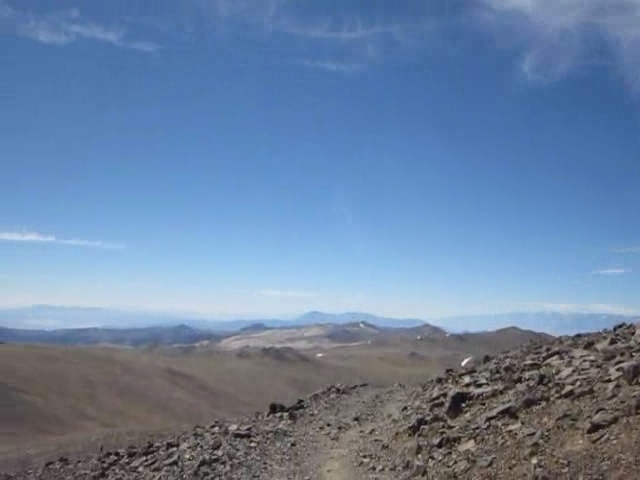 Video panorama from the windy saddle. Nice view! Too bad there isn’t any water up here. After the saddle it was time to climb the final set of switchbacks. Meanwhile, the views kept getting better, and the towns below us kept getting smaller. High cirrus clouds drifted slowly past up above us, keeping the deep blue sky an ever-changing kaleidoscope of patterns, just perfect for photography. What with the wind and the elevation, we felt that we were almost up in the jet stream along with the clouds! 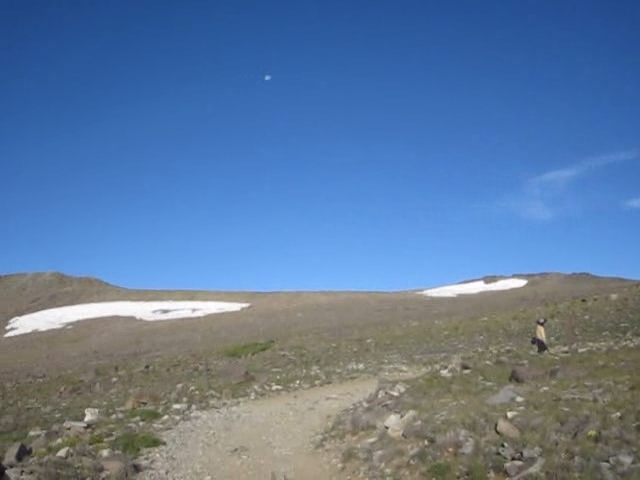 Snow on the shoulder of White Mountain Peak. Soon enough, we came upon some snow. It was melting in the summer sun, but there was still plenty of it. 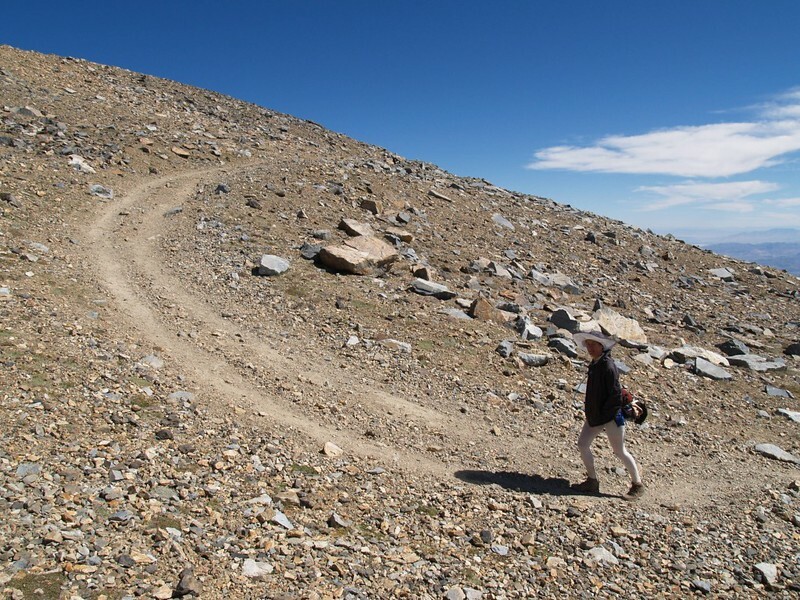 In fact, it was blocking the road in one section, but there was a use trail that other hikers had made which bypassed it. Not much of an issue, this late in the season. But it was still cool to see. And then we saw what I had been looking for all along: A Polemonium flower! Surely one of the prettiest of the high alpine flowers, the Polemonium only grows above 12,000 feet elevation, and is one of the wonders of the high peaks. 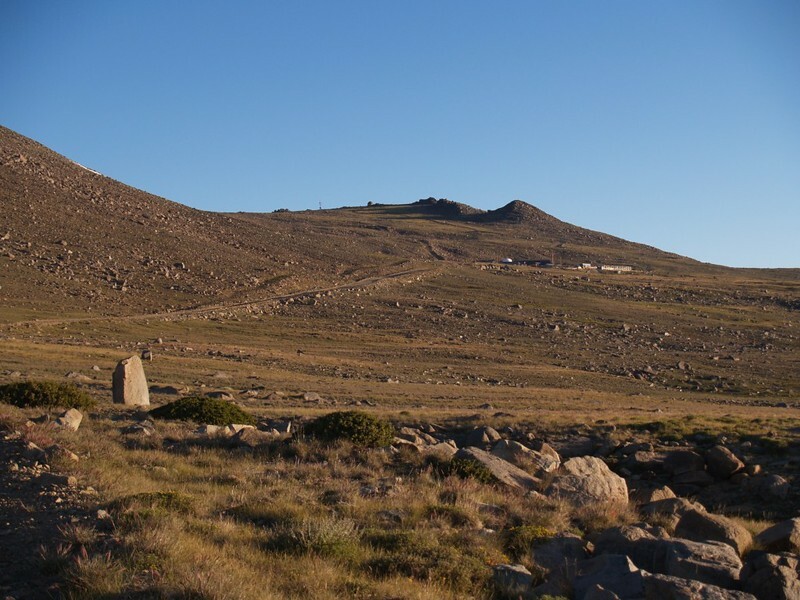 The Summit Hut is within reach as we have only two switchbacks left to climb! We finally reached the summit! 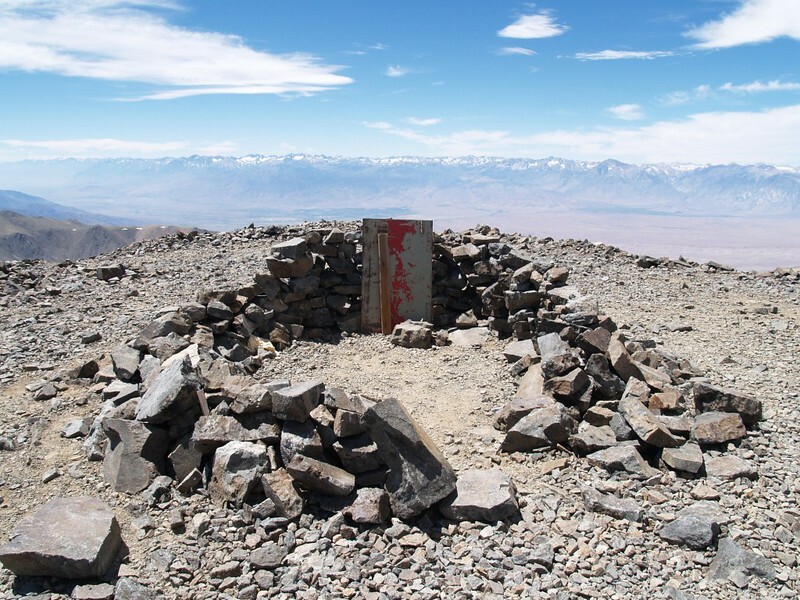 The third highest mountain in California, at 14,246 feet elevation. 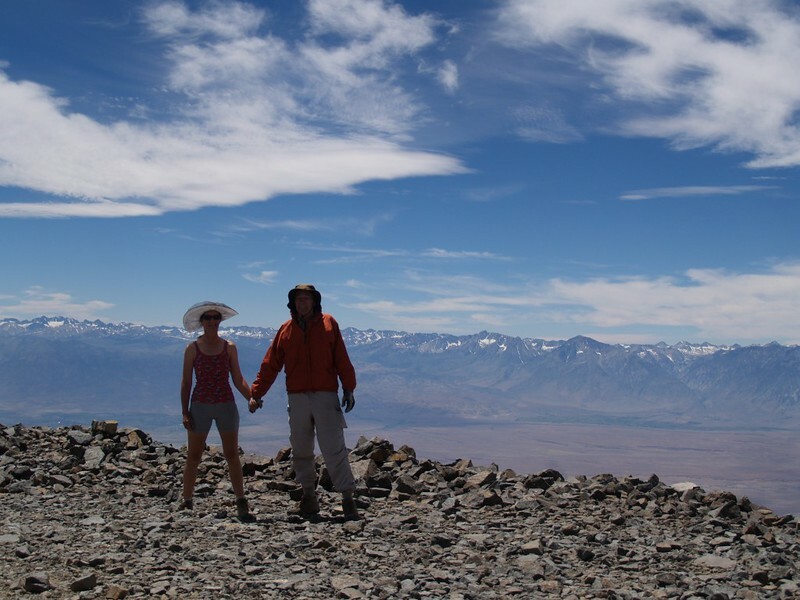 We were fourteeners at last! 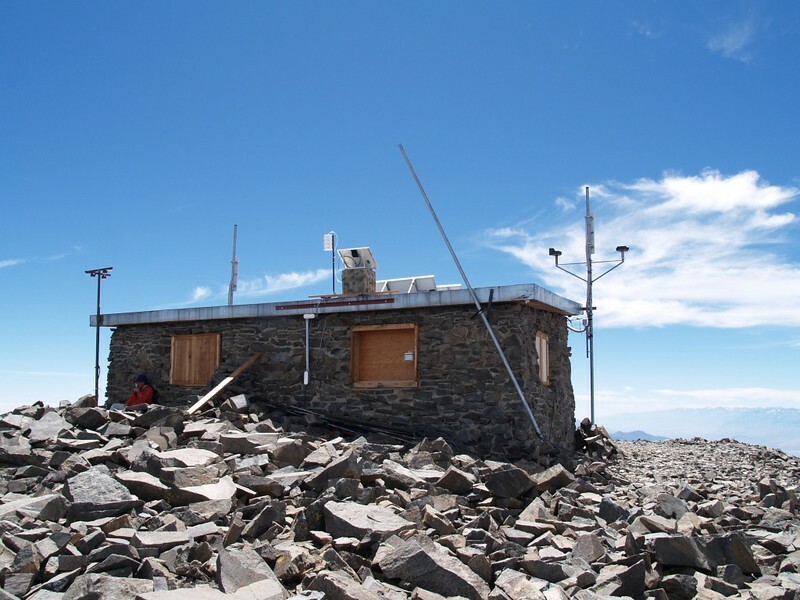 We took a number of obligatory photos of the summit hut, of the summit campsite, of the summit views, and of ourselves upon the summit. We signed the summit register. And then we retired behind the hut to get out of the wind. We ate our lunch and Vicki took a nice long nap in the sun while I read my book. 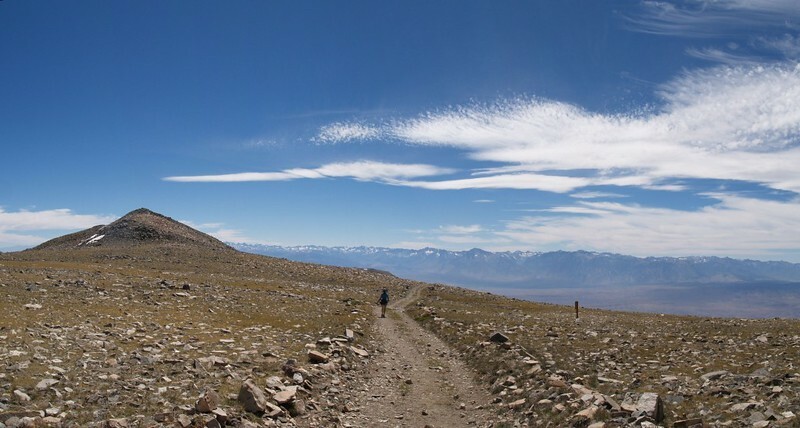 The front of the hut faced west, toward the Sierra, but the view from the back was nice, too, viewing distant peaks and valleys in the state of Nevada. 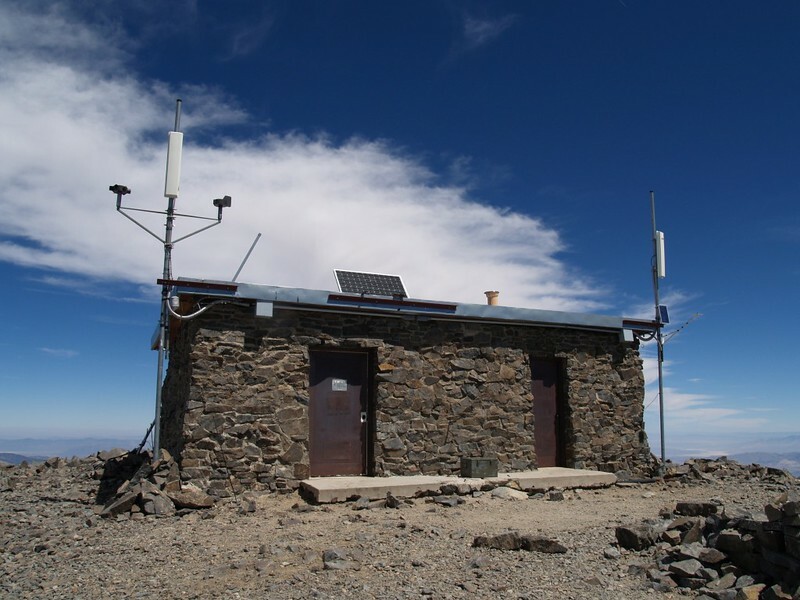 White Mountain Peak summit shelter. The highest wall is to the south. 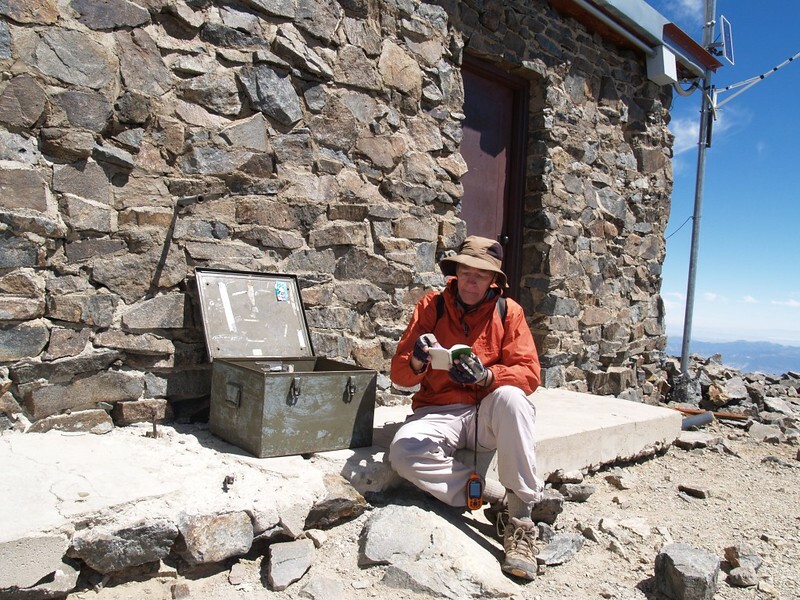 The summit hut is behind me. 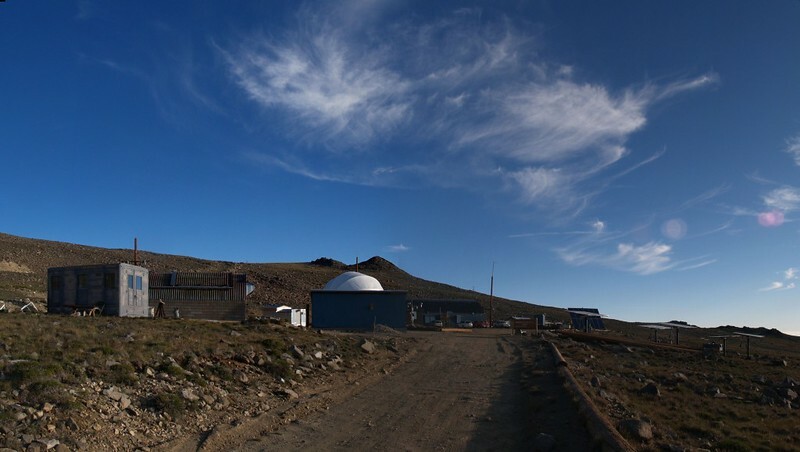 View of the back (north) side of the summit hut on White Mountain Peak. A good spot to get out of the wind! 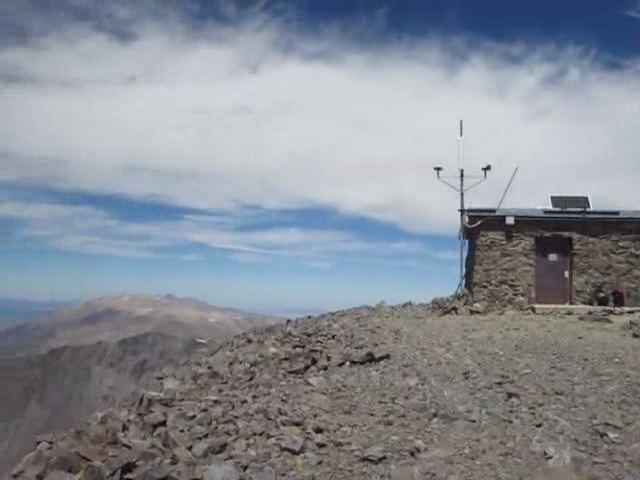 Summit panorama video. You can see a tremendous number of peaks from here on a clear day. The furthest one is Charleston Peak, near Las Vegas, Nevada, roughly 170 miles away! Check out HeyWhat’sThat.com for a list of peaks and a map. 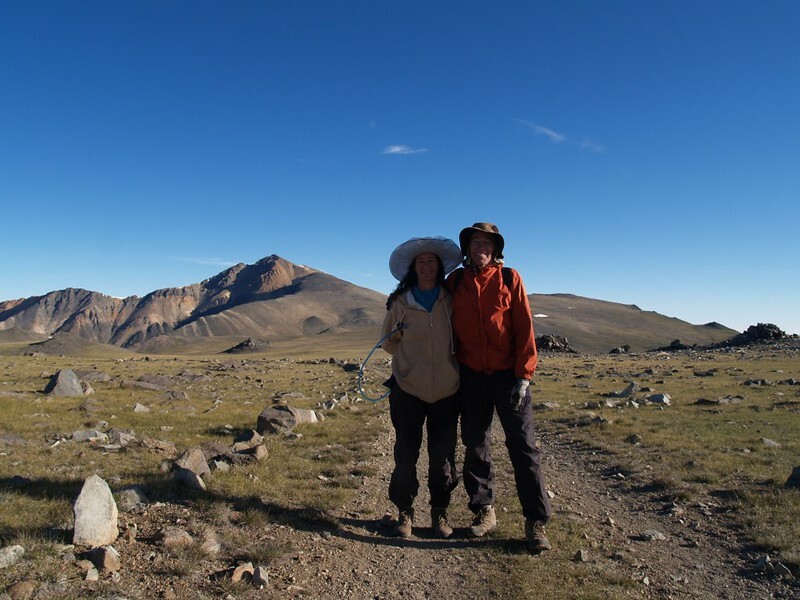 Vicki and I on the summit, fourteeners at last! After that, it was time to head back to the car. We had a long hike still ahead of us: seven miles, but most of it was downhill. 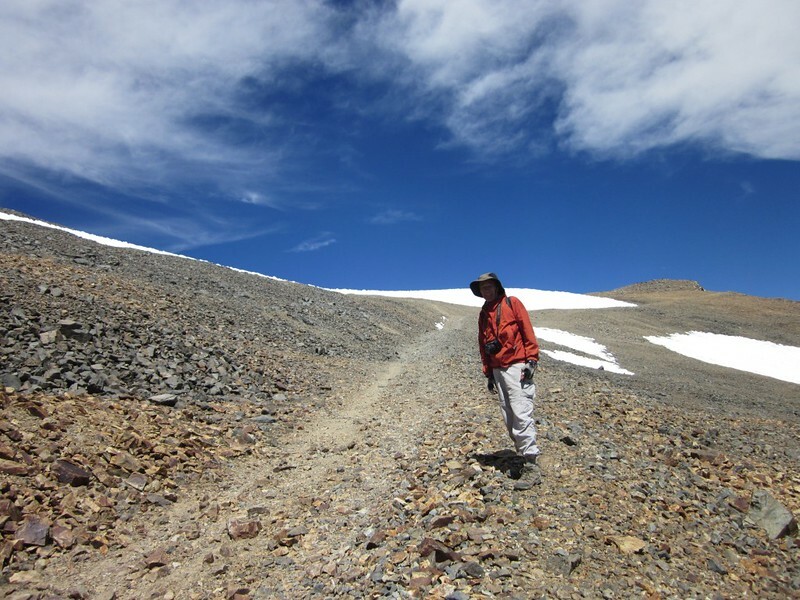 We were looking forward to easy hiking rather than slow, uphill plodding. And I’m not sure how it happened, maybe it was the nap on the summit, but Vicki was in fine form as we swept along down the switchbacks. The road was the perfect slope for her to stretch her legs, and she was actually hiking faster than me! I could barely believe it, as I hustled along in her wake. How was I supposed to stop to take photos along the way? But she didn’t care; she simply blasted her way down the slope. 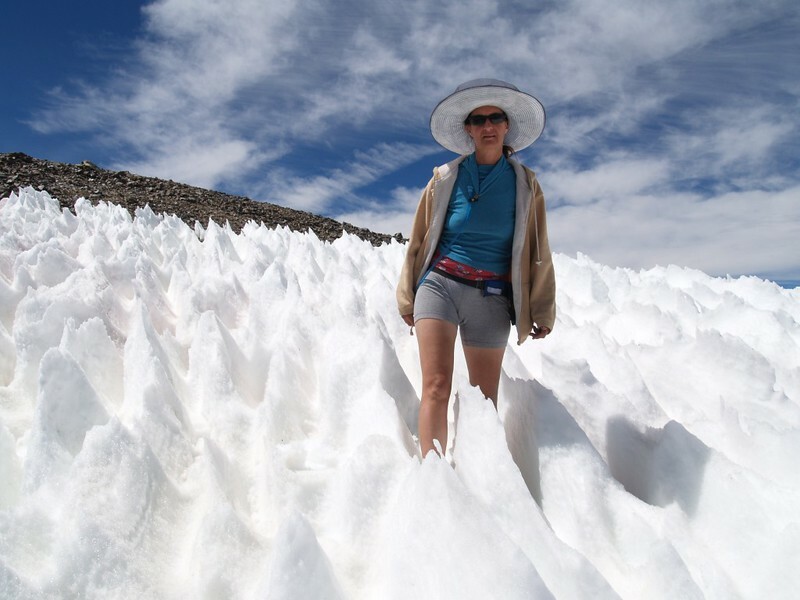 Vicki standing amid the high sharp suncups. On the way down, hiking the bypass trail and avoiding the snow which was blocking the road. 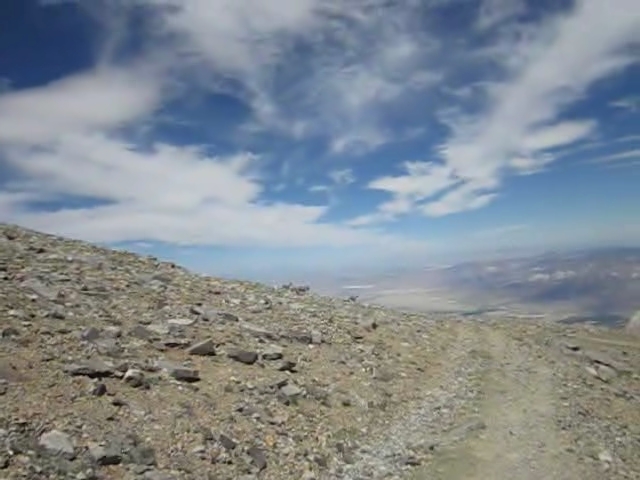 Panoramic view east toward Nevada from the shoulder of White Mountain Peak. 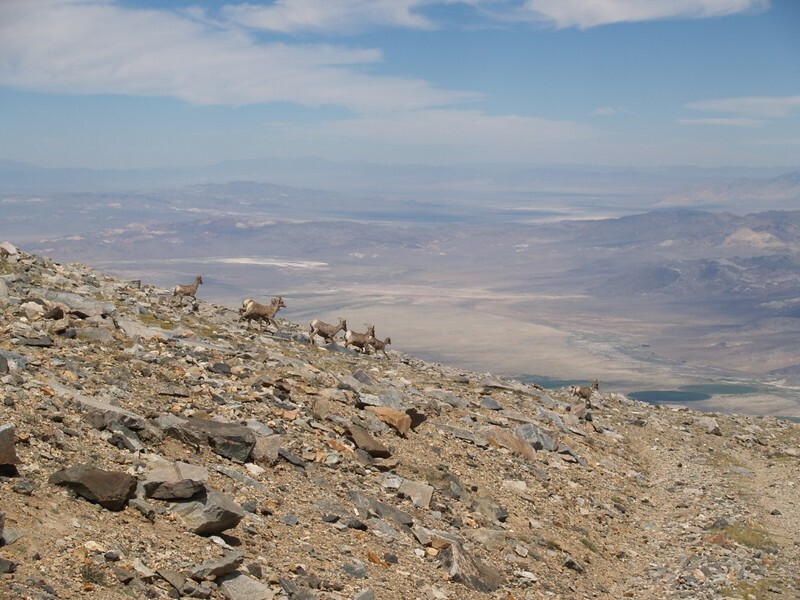 We came across a small herd of Bighorn Sheep! 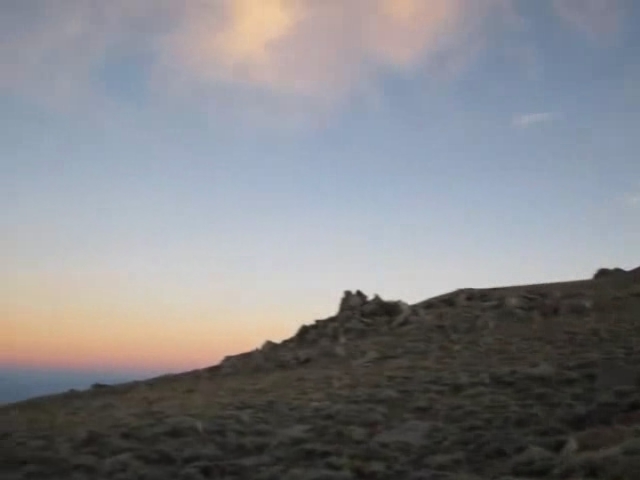 Video of the Bighorn Sheep! What a rare sight! 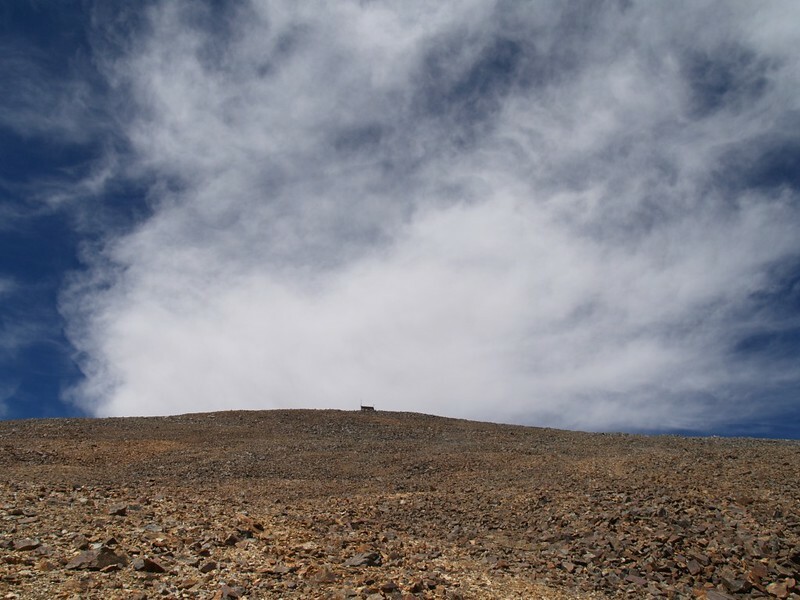 Looking back up at the peak and the high-altitude, ultra-blue sky. 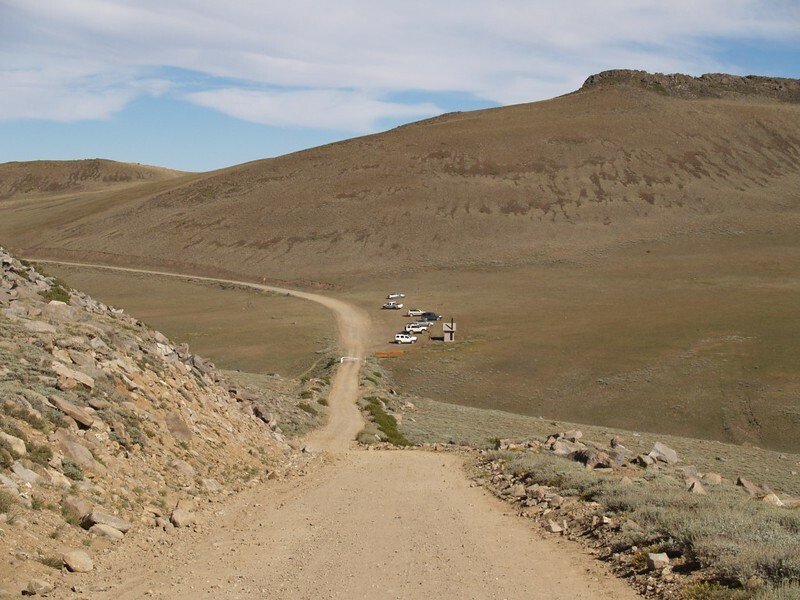 Once the main slope was finished, we were back on the flat plateau. It was long and boring. It wasn’t challenging, just endless. At this point we really wished thst we were back at the car already, but no such luck. 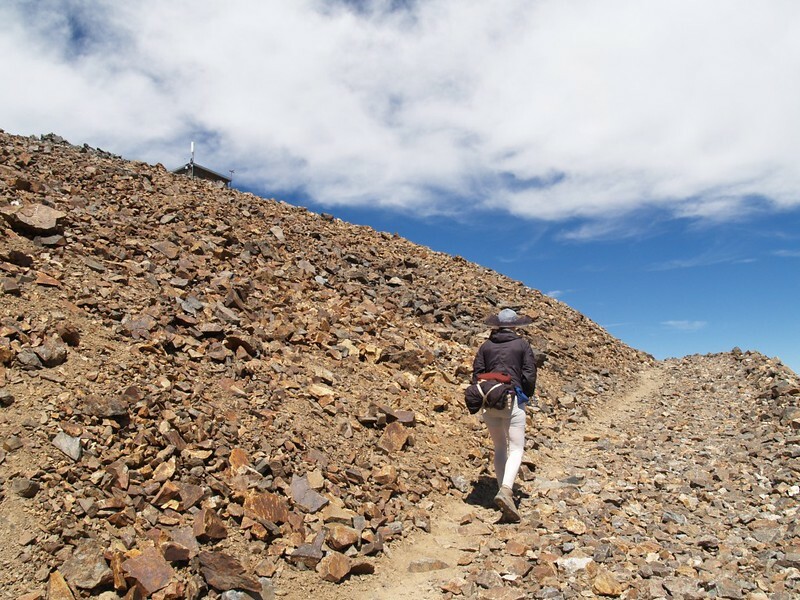 If you want to climb White Mountain Peak you have no choice but to put up with the long approach. That’s the deal. It’s a long road back to the car. We passed beyond the flat section and climbed a short way up to the observatory. Vicki really didn’t like this part of the hike. Uphill? At this late stage? No. No way. And then her hiking speed dropped to a crawl. It wasn’t steep or anything, but it was UP, and that was enough. If she’d had any extra energy she would have been grumbling about it. But all she could do was plod along, one foot in front of the other, for what seemed like forever. It was way too late in the day for this sort of nonsense. But we made it over the top in due time, and carried onward, down past the main research facility. Hooray! The cars! Just a bit further and we could sit down and relax. 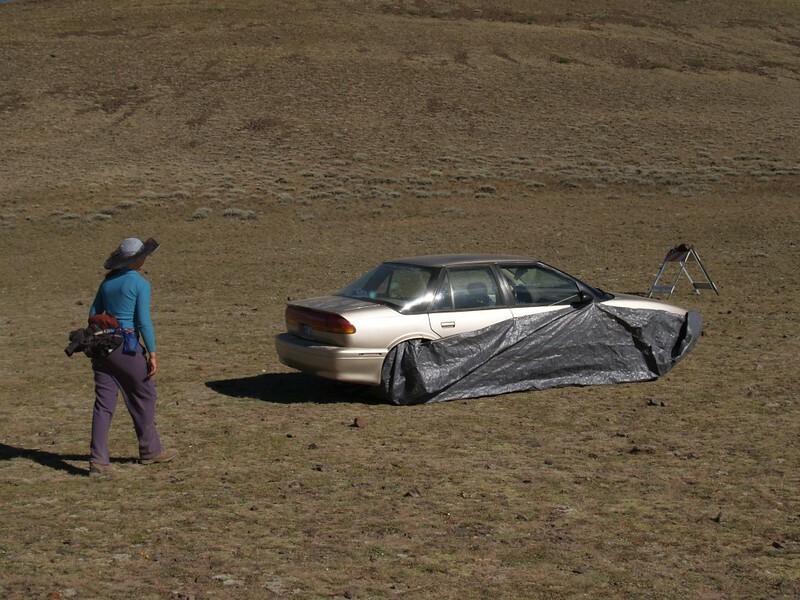 We arrived back at the car, and no marmots ate through our tarp! It took some time, but it helped that the rest of the hike was downhill. We continued moving along until we reached the car. Vicki was exhausted. So we untied the tarp from around the car and jumped inside, where we kept the windows rolled up and enjoyed the warmth and lack of wind. We took off our shoes and let our hot feet dry out, as we wiggled out toes in the air. We tilted back the seats and lay down for a nap with our feet up on the dashboard. 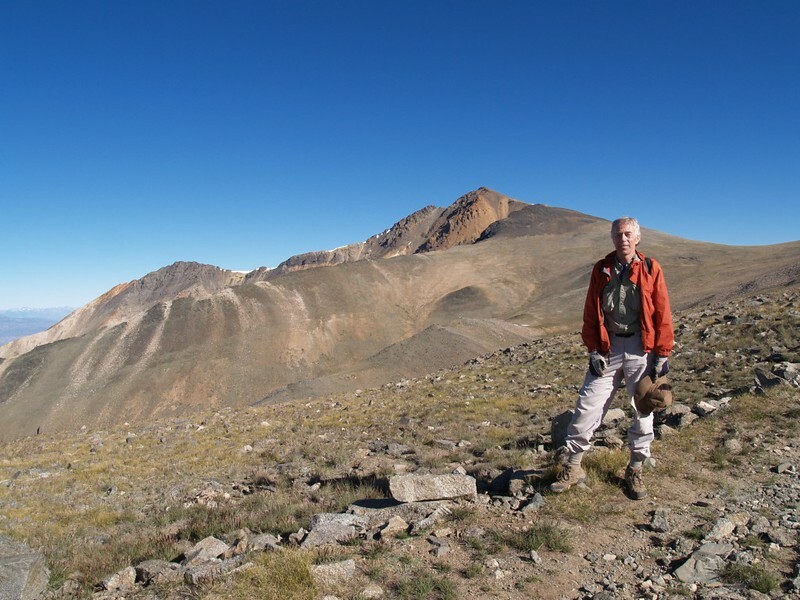 It sure felt great to be a Fourteener!